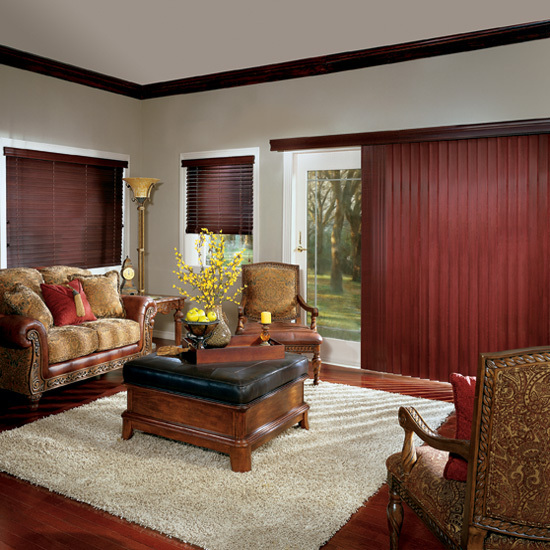 When it comes to decorating tall, French and patio door windows, vertical blinds are a very good choice. For those not in the know, these hang off a rail at the top of your window and can be adjusted well to block out or allow light into the room, and also to help control privacy. Vertical blinds are extremely flexible when it comes to appearance, and can be customised to the homeowner’s heart’s content. Some may be happy buying the blinds and leaving them as they are, but if you have your own ideas in mind you can have them ordered and made to your specification. If, on the other hand, you’re more confident in your own abilities then you could customise them yourself. If you do choose to do this, here are a few ideas and things to consider. This is more necessity than choice, as the size of the rail is usually dictated by the size of the window. The majority of rails fit most standard sized windows and doors, however the specific sizes of overly large or small windows and doors will decide whether this is necessary or not. It’s always wise to measure your windows and doors before purchasing a rail – either standard or customised – just in case. After this, you should know whether you’ll be able to purchase a standard rail or whether you’ll need one manufacturing to your specifications. It’s not always easy to match up everything in your room, and this is often where the DIY element of home improvement comes in. There are so many things to consider when making sure your room corresponds, such as wall paint, pieces of furniture and even the rugs on the floor. Often, people like to keep everything similarly coloured, or at least a colour that complements the existing furnishings, so it can be assumed that this is something you would also bear in mind with vertical blinds. It’s usually much easier to match up the slats from the blinds, as most rails are produced in a generic white colour. Another option would be to purchase vertical blinds in a more contrasting colour to a room. Whilst this won’t match up well, the way the window treatments stand out will really complement the existing furniture and décor anyway, so that shouldn’t be too much of an issue. Patterned vertical blinds are readily available from most vendors and can really add more character to a room. The chances are that a lot of traders will have ready printed patterns that could come somewhat close to what you are looking for. However, if this is not the case then many will have an alternative option – either a method of printing or a way of ordering your customised blinds in. No matter how you get there, there is a way to get the perfect vertical blinds for your home. Great post. I am a new follower who found you through the We Are Canadian blog hop. Please stop by Horseshoes and say Hi.